From Here To Eternity won eight Academy Awards back in 1953, but not Best Actor. 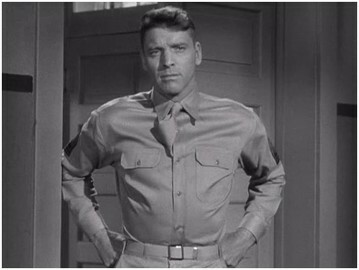 I assume that Montgomery Clift and Burt Lancaster split the votes in that category though it’s hard to argue with winner William Holden’s performance as the crabby lone wolf in Stalag 17 either. Clift was the heart of the picture, batting his doe-like eyes to and fro, refusing to break under all the pressure heaped on him by a boxing-obsessed captain, while Lancaster was the libido of the film, testosterone practically oozing from every pore as he eyed the Captain’s wife in a way that only someone like Lancaster could get away with. 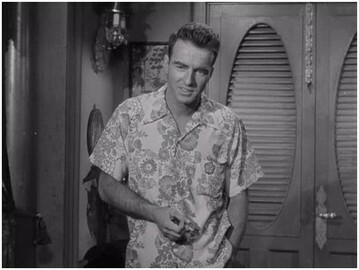 Where Clift was sensitive and tormented, Lancaster was unyielding and always sure of himself and his place. They ended up as friends because each of them knew the other was a soldier’s soldier. And even though they were the best soldier the other had ever seen, you can see that one of them is probably a little too sensitive, a little too thoughtful, and a little too stubborn to survive. Robert E. Lee Prewitt (Clift, reminding one of a slightly more grown up James Dean) arrives at his new army base in Hawaii. He has just transferred out of his old outfit because some crony of the captain there became first bugler over him, even though he is the best damn bugler in the army! He even played taps at Arlington in front of the President and carries the mouthpiece around with him in his pocket. The reason he ended up here is that his new captain, Dynamite Holmes, is a fanatic about boxing and this Prew kid is the top middleweight in the army. Dynamite wants desperately to win the boxing finals this year and all he needs to fill out his roster to assure himself of that is a good middleweight and Prew is the man to do it. But Prew refuses to box due to a tragic sparring incident. Prew swore he’d never fight again, which is interesting because he seems to get into an awful lot of fights on the island. This doesn’t sit too well with Dynamite and the boys decide that they’re going to give Prew the treatment until he quits acting like a sissy and goes back to beating up people for a living. Dynamite’s right hand man is the very efficient and serious Sgt. Warden (Lancaster). He’s a no-nonsense, tough talking, bull of a man who spends most of his time trying to get all efficient with the Captain’s icy blonde wife, Karen. Karen is ripe for the picking because the Captain spends most of his days when he’s not watching sweaty guys in boxing trunks beat each other up, off with his girlfriends. You know how Prew has his tragic back-story? Well, Karen has one of her own which she lays on Warden during their big beach scene. Talk about good conversation! Meanwhile Prew is getting the business from those wacky guys in his company. They trip him, make him run laps, assign him to dig really big holes, and dump bloody water all over the floor of the gym he’s trying to clean. The only guy on his side is Angelo Maggio – Frank Sinatra in a performance that shows quite a bit of depth and was his come back role. Maggio is a fun loving guy who doesn’t like to see Prew get pushed around so they hang out together at one of the social clubs in town and that’s where Prew meets Lorene. She’s a working girl there and Prew falls for her. They become an item though things hit a rough patch when Lorene reveals herself to be something of a shallow gal when she says she just wants to earn enough money to go back home and get into the country club so that she can marry a proper guy instead of a soldier. 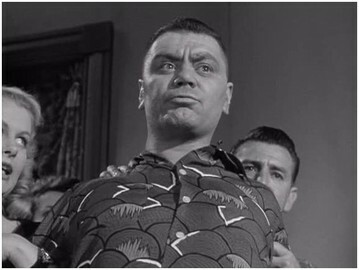 In addition to all these things happening, the movie is such a sprawling effort that Sinatra’s Maggio even has time to become involved in a feud with Ernest Borgnine! The calendar we see while Lancaster is leaning against wall though is the most obvious of foreshadowing for the tragic climax. 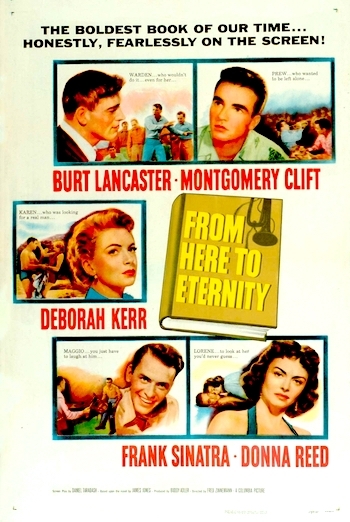 At its core, From Here To Eternity is about people who want to love and to find love, but are incapable of overcoming their own emotional baggage (Karen’s self-loathing, Lorene’s desire to be accepted by society, and Warden’s refusal to change his life and take any chances) even at the expense of their own happiness. It wasn’t so much that he never compromised what he was all about, it was that he was always true to what he was. A good soldier, a good friend, and a good lover. There was nothing to compromise for Prew, because those qualities weren’t just constructs that he had built up to survive in the world. From Here to Eternity with its old-time Hollywood star power is thrilling to watch, the emotions up on screen so raw that you can practically taste the desperation these people are feeling as they try and fight to hold on to love in spite of themselves. And yes, that is Claude Akins, Jack Warden, and George Reeves periodically wandering in and out of scenes.